Der Objekt 257 ist ein sowjetischer schwerer Panzer der Stufe 9. Dieses Projekt eines schweren Panzer mit der Bezeichnung IS-7 wurde 1945 entwickelt. Das Fahrzeug sollte einen elektromechanischen Antrieb verwenden. Die Entwicklung wurde in der Dokumentationsentwurfsphase aufgegeben. Von diesem Fahrzeug existieren nur Konstruktionszeichnungen. Der Objekt 257 führt zum IS-7. The tank is a major armor upgrade from the IS-3. You will bounce a lot of shells with it. Some folks prefer the top gun from the IS-3 (BL-9) over the upgrade gun (BL-13). The reason for this, is the BL-13 uses APCR for it's standard load. And the APCR has problems with normalization against armor. There is also a price difference from standard AP, but that is minimal at about 900 credits more per round. Experiment with both guns to see which you prefer, as the upgrade gun must be unlocked to get to the improved turret and the IS-7. The IS-7 heavy tank is well known to armour enthusiasts. A combination of impressive armour, a powerful gun, and an engine that could propel the 70 ton tank at 60 kph made it the pinnacle of its class. At the same time, no less than 7 vehicles existed under the IS-7 index, and three of them were called "Object 260". The creation of this vehicle is shrouded in mystery, partially due to the conditions of secrecy created at the factory #100 design bureau. Thanks to recently discovered archive materials, we can now see how the IS-7 (back then, still Object 257) developed in its early stages. New German armoured vehicles that arrived at the front lines in 1943, particularly the Ferdinand, caused serious changes in prospective Soviet heavy tank designs. In November of 1943, GABTU created tactical-technical requirements for a 55 ton heavy tank. Soviet designers did not simply increase the thickness of armour like their foreign colleagues. Work started on determining the optimal angles for the the turret and hull that would allow a drastic increase in protection with a minimal increase in thickness. Work on this new tank coincided with the beginning of direct competition between the SKB-2 design bureau headed by N.L. Dukhov and experimental factory #100 headed by J.Ya. Kotin. This competition was similar to what happened in Leningrad in 1938-40 between the Kirov factory and factory #185. Now the fierce competitors were not only in the same city, but in the same organization. Factory #100 was defined within ChKZ in March of 1942 and began working on experimental development, inheriting the 200 index for its creations from the Kirov factory (Objects 233, 237, etc). ChKZ's SKB-2 began using 700 indices. Its first tank was the Object 701, a proposed replacement for the IS-2 (Object 240). Meanwhile, instead of working on a modernization for the IS-2, factory #100 began working on its own prospective tank, later indexed IS-6. This tank was developed in close cooperation with NII-48, which promoted the use of sloped armour. In order to keep information about the IS-6 from surfacing too soon, work was performed in strictest secrecy. A special room was allotted where only certain designers were allowed to enter (Shashmurin, Neidman, Turchaninov, Mitskevich, etc), as well as Kotin himself. Military representative at factory #100 Vovk was not allowed into the room, and he raised a ruckus on this subject in April of 1944. The IS-6 design, proposed in early June 1944, was quite controversial. The attempt to make a tank in the IS-2's weight class failed. The IS-6 weighed over 50 tons. Meanwhile, the thickness of its armour was closer to that of the IS-2 than the Object 701. Kotin managed to arrange for the construction of the tank in two variants (Object 252 with a mechanical transmission and Object 253 with an electric transmission), but the results of the trials were unsatisfactory. The tanks had trouble with their suspensions and their top speeds were less than those of the heavier competitor. The electric transmission was also quite unreliable. The tank had no advantages over the SKB-2 design. Nevertheless, Kotin managed to send the tank to Moscow for a demonstration alongside the Object 701, but this did not affect the fate of the IS-6. Meanwhile, in late November, the IS-6 was radically redesigned. This is linked to research from NII-48. The tank received a new hull with a pike front and a new turret. Since the IS-6 had no future in late 1944, the modernization project stopped there and it was never built in metal. The time spent on the tank was not wasted: work on a new tank began in the winter of 1945 with it as the foundation. The first efforts towards creating a new generation tank to replace the Object 701 began in early February of 1945. On February 6th, order #66 was issued to the People's Commissariat of Tank Production. According to this order, SKB-2 was supposed to develop a new tank on the basis of the requirements initially issued for the Object 701. The design bureau had no time for new concepts. Work on the Object 701 was going at full throttle, the configuration of the hull and turret kept changing, and there was no light at the end of the tunnel. Work on finishing up the Kirovets-1 IS-2 modernization (blueprint index 703, or Object 703) also began to ramp up around that time. One month later, the Object 703 was accepted into service under the index IS-3, further delaying the Object 701. The factory #100 design bureau was in a completely different position. As of 1945, work on the IS-6 ended and the factory was mostly testing out new assemblies. The factory also attempted to make itself independent of ChKZ, who always delayed shipments. The competition reached the point of absurdity where the factory, only a few hundred meters away, refused to turn over even mass produced components despite direct orders from the People's Commissar of Tank Production, V.A. Malyshev. This situation was not helped by the IS-6, which was so aggressively promoted by Kotin and still lost out to the Object 701. Most likely, work on the new tank began as Order #66 was issued, in February of 1945. There is no precise information about this since Kotin once again opted for secrecy. A new chapter in the drama titled "Representative Vovk and the Chamber of Secrets" began on March 28th, 1945, when the military representative sent a letter to GBTU complaining about the events. "I began my role as senior representative of the GBTU TU at factory #100 in April of 1944. I already reported that my work at this factory is made difficult by factory management constantly concealing all experimental works at the factory from me. At first, this was displayed by the organization of a special room where entry was permitted only to those on a list created by comrade Kotin, in which I was not included (this was concealing the design of the IS-6 from me). Lately (since comrade Kotin was appointed factory director), this secret room concept was expanded. All new projects are developed in secret rooms where access is restricted to workers of that project. Each group in the design bureau selected a special subgroup from its staff to work on a new heavily armoured tank and an ISU-122 with two D-25S guns. I attempted to discover the reason for these measures and talked to comrade Kotin on several occasions. From these discussions, I learned that the main reason was the fear of discovery of factory #100's designs by the Kirov factory, as as a representative of GBTU, I could pass information onto the Kirov factory." Vovk's attempts to bring order to experimental work and to stop the battle between two design bureaus were unsuccessful. As mentioned above, SKB-2 had no time for an experimental tank, and factory #100 got its chance. On April 7th, 1945, technical specifications for a 122 mm gun with a muzzle velocity of 1000 m/s for a heavy tank were signed. The gun would have a coaxial DShK machinegun and would fire four rounds per minute with two-piece ammunition. These characteristics revived work on the 122 mm BL-13 gun, started back in December of 1943. The gun was designed at OKB-172 based on the D-25T gun and the barrel from the OBM-50 (BL-9) tank destroyer gun. The technical project of the BL-13 was jointly developed by OKB-172 and factory #100 in February of 1944, and the first results appeared in July. For several reasons, the IS-6 used the D-30 gun instead, which wasn't much better than the D-25. Now, the BL-13 had a second chance at life. The new tank with factory code 257 (Object 257) and index IS-7 started taking shape by late May of 1945. P.P. Isakov's design group took the modernized IS-6 as the foundation for their work, but the design was radically changed. Some influence from the IS-6 can be seen in the hull and turret, commander's cupola, driver's hatch, and the turret traverse mechanism. Despite the fiasco during trials (a fire broke out during the first start), the electric transmission was used from the Object 253. One of the main objectives for the Object 257 was the strengthening of armour. 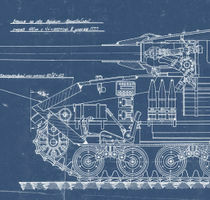 Since the tactical-technical characteristics remained at the level of the Object 701 (55 tons), the engineers had to seek out nonstandard solutions. The driving forces behind the project were engineers G.N. Moskvin and V.I. 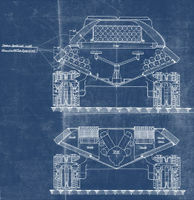 Tarotko, the people who came up with the pike nose and other solutions that influenced Soviet and worldwide tank building practice. The thickness of the upper front plate grew to 150 mm, and the shape changed somewhat. The vulnerable "step" around the driver's hatch. It was removed by slightly increasing the slope of the upper front plate, but increasing its thickness improved protection. The hull was shortened, which compensated for the increased weight. The mass of the hull grew from the IS-6's 21 tons to 23 tons, while the armour became significantly more powerful. According to calculations, the BL-13 gun would not be able to penetrate it at point blank range. The lower part of the hull was changed even more radically. The use of suspensions with internal elements forces engineers to make at least some part of the side of the tank vertical. This weakened the structure of the hull. On the Object 257, the suspension was removed from the hull and the sides were located at an angle. The sides of the tank were impenetrable for the German 105 mm Flak 39 gun even at point blank range and increased resistance to anti-tank mines. However, laying out the fighting compartment and engine compartment became more difficult. Another problem was that the currently used torsion bar suspension did not fit into a hull shaped like this. The solution was the use of a bogey suspension with buffer springs. This solution was similar to that used on the American M4A2 medium tank, but the Soviet design differed significantly from the original. The Object 257 used the 122 mm BL-13-1 gun. The difference from the original design included a mechanical rammer. According to calculations, this would increase the rate of fire to 8-10 rounds per minute. In June of 1945, the BL-13-1 autoloader was tested and worked reliably, but at a speed of 7-8 RPM. The turret that the gun was installed in had its roots in the IS-6, but it changed drastically. The armour protection was increased to match the hull. The shape was also changed. As in the IS-6, ammunition was located in the bustle, but now the 30 round rack was made more comfortable for the loader. According to calculations, the 55 ton tank would reach a speed of 50 kph. It would be propelled by the V-16 engine developed at factory #77. This was an attempt at a modernization of the V-2, and work on it was going on since 1944. As with the Object 253, the engine was in one block with an electric transmission. 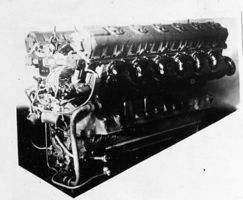 The power of the engine was not listed in the design, but it was expected to show similar characteristics to the V-12 used in the IS-6 and Object 701. Final materials on the Object 257 were prepared on June 6th, 1945. 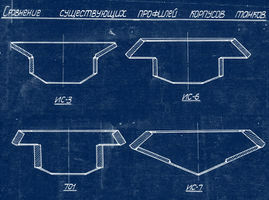 The overall design was approved by Malyshev, but requirements for heavy tanks started changing around this time. Initially, the weakest link was the engine. Trials of the V-16F in March-May of 1945 showed that the engine was unreliable. It was not even supercharged to the level of the V-12, and supercharging it to 600 hp already showed many defects. There were also defects at 520 hp, and it was already unacceptable for a heavy tank at this point. At that power, it was inferior to the V-2IS engine. Work on the V-16 continued and it was finally struck out of the IS-7 project in early 1946. By then, the configuration of the tank changed. Information about the Maus super-heavy tank found near Zossen that arrived in GABTU on June 4th, 1945, made even more changes. Another tank was found at the Kummersdorf proving grounds. Also, a functional Jagdtiger was captured in Austria. It was clear that protection from the 122 mm BL-13 gun from the front was inadequate. Now, the armour of prospective heavy tanks would have to protect from the 12.8 cm Pak 44 and KwK 44, used on the Jagdtiger and Maus respectively. This meant that the armour had to get thicker. The armament was also revised. The armour of the discovered German tanks was the limit for the BL-13. A substitute was needed, which was found quickly in the form of the S-26 130 mm gun, designed at TsAKB under the supervision of V.G. Grabin. There was a new problem: the existing turret of the Object 257 could not fit the new gun. On June 11th, 1945, the requirements for a new heavy tank were designed. The mass was set at 60 tons, the crew increased to 5 (a second loader was added). The armour must protect from the 128 mm German gun. The armament was either a 122 mm or 130 mm gun with a muzzle velocity of 1000 m/s. The torsion bar suspension was again made a priority, but under the condition that it would be outside of the hull. The Object 257 did not meet these requirements and the factory #100 design bureau had to build a new tank on its base. The story of the IS-7 was just beginning.